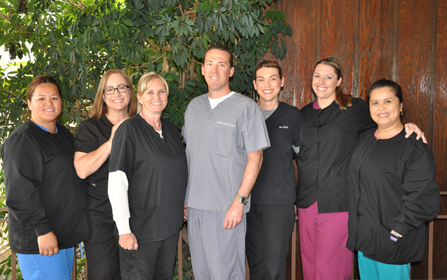 Dr. Bryan Davis and staff welcome you to our beautiful Covina Practice! We are very proud of the quality of care we provide to our patients. We are committed to ensuring the best possible family and cosmetic dentistry in a comfortable and caring environment. As one of the most technologically advanced offices in the Covina area we pride ourselves on the use of specialized equipment, such as Cerec same day crowns and veneers. Utilizing the most modern equipment and techniques we are able to provide the highest quality care to all of our patients. We look forward to seeing you. Dr. Davis graduated at the top of his class from the University of Southern California School of Dentistry. From this achievement he was selected to be a member of Omicron Kappa Upsilon which is a national dental honor society recognizing only the top 10% of dental graduates nationwide. He is highly skilled in all aspects of general, cosmetic, and restorative dentistry and is a member of numerous dental organizations such as the AGD, CDA, ADA, and SGVDS. If this is your first time visiting our office and you're interested in finding out more about our services please click on the link below. We are pleased to offer our patients CEREC restoration services -- a superior method of creating precisely-designed, color-matched and highly durable ceramic fillings, crowns, and veneers right in our practice. Copyright пїЅ 2010 Dr. Bryan Davis, DDS. All Rights Reserved.